Jennifer Wong reviews a new book by Pippa Little. 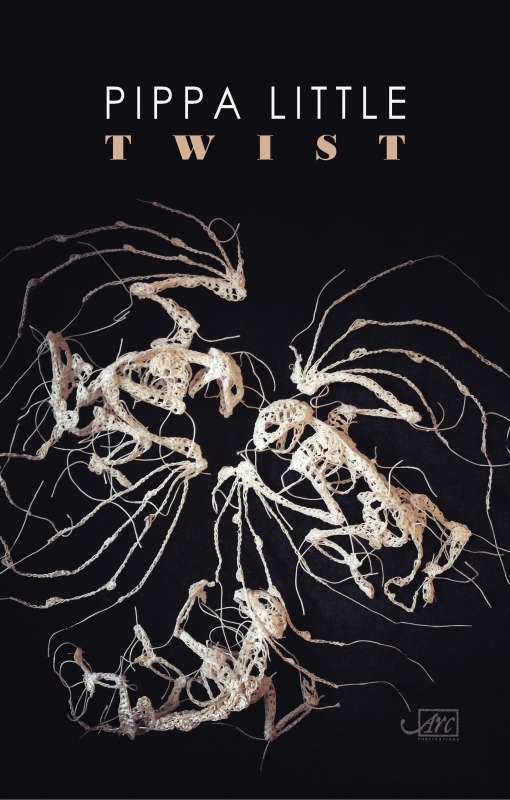 Through her nuanced, free-spirited and metaphorical language, Pippa Little’s latest collection, Twist, conveys the intricate interplay between knowledge and imagination, and meditations on the intimacy and bond of sisterhood. Born in Tanzania, raised in Scotland and who now living in Northumberland, Little’s poetry captures glimpses of the human imagination and one’s hidden knowledge about life. By offering the reader two contrasting mythical visions of life—a fertile body in childbirth labour and a dying body waiting for closure—she suggests the many twists and complexities of human experiences. Moreover, in many of her poems, the poet complicates the poetic text with unsettling language and the surreal. For example, in ‘Night Drive’, a very beautiful poem named after Seamus Heaney’s poem with the same title, Little interweaves the real with the surreal, showing us the ordinariness of a night drive punctuated by strange thoughts on the glittering stares of cattle (‘The eyes of cattle, starting open at the night, glitter and flare’) and the ‘momentary leap of the heart’ in dodging a badger that slips under the ditch. Altogether, this is a sophisticated and adventurous collection from an assured poet, one that questions one’s everyday beliefs and ways of seeing, while pushing the boundaries of poetic voice, syntax and form. Born and raised in Hong Kong and currently in the UK, Jennifer Wong is a writer, researcher, and translator. She is soon to complete her critical/creative PhD at Oxford Brookes. Alex Wortley reviews a new edition of Michael Augustin's book, twenty-four years after the original was published. 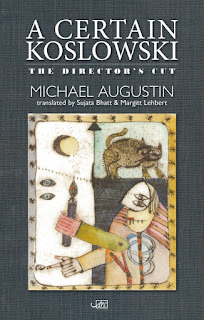 Michael Augustin’s A Certain Koslowski: The Director's Cut is translated by his wife, Sujata Bhatt, and Margitt Lehbert, a Swiss-German who has translated the likes of Paul Muldoon and Carol Ann Duffy into German. Here they translate from German into English. The most obvious adaptation the duo make is to the collection’s title: they prefix the original with the English-sounding formation ‘a certain’. This signals a poetic picaresque mode, where we are invited to follow the eponymous hero through life. Augustin chooses prose-poetry for each humorous episode filled with incidence, surrealism, and strangeness. Laugh-out-loud stuff, one would think. And it is, largely, if you’re a fan of glib episodic flights into the realm of the absurd with no discernible purpose. The bizarre opening poem ‘Immaculatus’ is fantastically blasphemous, detailing how the immaculately conceived (meaning virgin-born?) Kowlowski ‘slept with his natural mother’ and found her to be, ‘without a doubt, still a virgin’. Augustin then lewdly concludes how ‘afterwards, something like that is pretty hard to prove’. A slightly off-colour opening, perhaps, but this is tempered by the second poem, ‘Birth Pains’. Here Augustin indulges in the surreal, purposely contradicting the biographical details revealed in the previous poem. After his being born, ‘two of [Koslowski’s] fathers reportedly staged a bitter shootout’. The surviving father of the virgin-born Koslowski is then impelled to drunkenness. It’s hard to see what the intended effect of all this is, and perhaps that’s the point, to baffle and amuse the reader. The word-play in this collection has just such an effect. ‘A Misunderstanding’ riffs on the definition of ‘beheading’, and ‘An Experiment on Himself’ describes how the adolescent Koslowski discovers the inebriating effects of alcohol. Wanting ‘to make public his discovery’, he finds that everyone he encounters is already thoroughly au fait with drink. Learning this, and ‘sobered forever’, Koslowski gets drunk ‘a second time’. Not quite laugh-out-loud, but slightly humorous. Likewise, the poem ‘Question and Answer’ is quoted on the blurb of the collection, so it must be a highlight, and in a way it is. Koslowski’s interlocutor asks: ‘Regardless of what one asks you, one always receives a wrong answer?’. Koslowski replies, ‘That’s right!’ Quite funny, but it all seems a bit sub-Flann O’Brien. Weak humour, with the occasional interruption, is often met with bad taste. After the off-colour opening poem, we have, about mid-way through the collection, two poems about suicide. The first, ‘A Suicide Attempt’, details how Koslowski is prevented from killing himself on the Paris underground by another man who jumps in front of his intended train before him. Koslowski slopes off ‘red faced and deeply insulted’. So, are we to infer from this that people who attempt suicide are attention-seekers? In the following poem, ‘Another Suicide Attempt’, Koslowski halts before the act on hearing news of a neighbour who, ‘during a suicide attempt’, had a serious accident and ‘died as a result’. I simply don’t see how this is funny, or in any way illuminating. I’m sure the subject can be tackled sympathetically, and in an amusing or satirical way, but Augustin utterly fails to do so here. There is a revealing line in the aptly-titled ‘Jokes’ which reads: ‘Koslowski is blessed with the singular talent of botching the punch line of virtually every joke he tells’. Maybe this is Augustin slyly disclosing his strategy in this collection: to be purposefully unfunny. ‘Jokes’ concludes how Koslowski, on ‘faithfully botch[ing]’ the punchline of his jokes, provokes uncontrollable mirth among his friends (as ‘the whole room rocks with laughter’). Perhaps this was Augustin’s desired effect, but, for me at least, this collection largely succeeded in producing the inverse reaction. 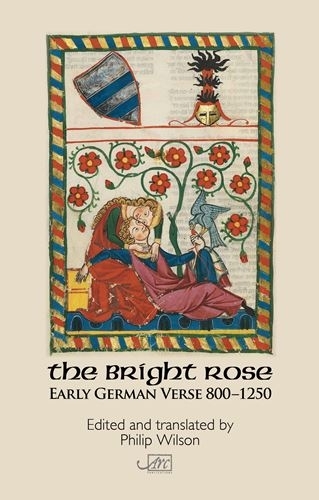 Inigo Purcell reviews translations of some of the earliest known German poetry. Philip Wilson accomplishes two things in The Bright Rose, the first of which is translating early and middle High German verse in a way which both reads as fresh and hews close to the original texts: Arc’s parallel texts here give a clear idea of the sound patterns within the original text, and in some cases vocabulary, which Wilson has rendered as close as possible to the original. As Early and Middle High German is quite a niche field (and, Wilson notes, very few Early High German texts survive), managing to convey to the general reader how this translation captures the original text is an impressive feat. The second accomplishment is choosing a selection texts which establish the character of German verse in the 480-year period in which he is working; a blurb makes clear that Wilson is interested in conveying how ‘human nature may not have changed as much as the German language has’, and he succeeds in this. He does this via a selection of texts which offer snapshots of different styles: a fragment of the earliest surviving Old High German poem, the Hildesbrandlied, in which a father and son face each other on the battlefield, initially unaware of the other’s identity; a set of charming invocations against threats such as bees, imps, and your horses getting ill; and when he reaches the middle High German period, a series of love lyrics on the returning theme of lover’s being parted by the dawn. Perhaps one of the most resonant of these is Wolfram von Eschenbach’s poem in which the watchman who has smuggled in the male lover arrives to warn the pair that dawn is approaching, and he should leave. As in the Hildesbrandlied, the story is incomplete, but whereas in the earlier poem it is a fragment in von Eschenbach’s poem it speaks to the developing narrative sophistication of medieval German verse. The previous poems have made clear how ‘lovers being parted by the dawn’ is a narrative trope within the verse of the period, so the reader can see how Eschenbach is playing with this form. The final poem Wilson choses to include also plays with this form: Steinmar’s ‘Love outside the court’ also features some lovers parted by the dawn, but unlike the ladies and knights in the earlier poems, they are a servant and a maid in a cowshed. All in all, Wilson manages to create both an impressive translation, and, through his careful curation of the verse he has chosen to translate, illuminate the reader about an area of poetry they have probably not encountered before, and leave them curious as to what else exists in early German poetry.